Happy Wraps are the softest, most relaxing microwave herbal neck wraps on the market, guaranteed! The Happy Wraps Neck Wrap provides the ultimate in Neck Pain Relief and Stress and Migraine Relief. Soothing warmth melts away pain, tension and stiffness from neck, back and shoulder areas leaving your body relaxed, renewed and refreshed. Our healing 12 herb blend features the pleasant aroma of chamomile,cinnamon and fresh cut mint for the ultimate aromatherapy experience. For Hot Therapy – Microwave it. – For Cold Therapy – Freeze it. Stays in place while walking, sitting at your desk or standing or relaxing around the house. Every day is like a day at the spa. 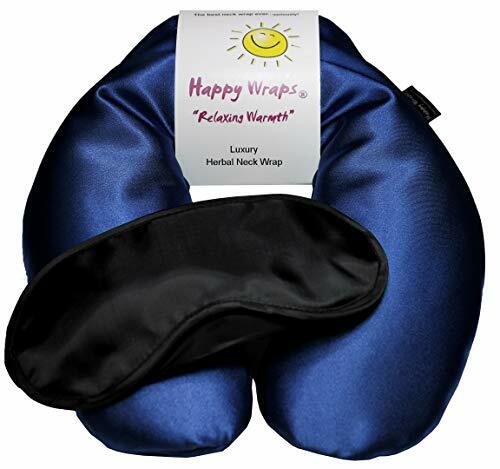 Enjoy our gift to you a Happy Wraps Lights Out Sleep Mask for the perfect nights sleep.Our gift to you will provide a total relaxation experience. Always trust the Happy Wraps Brand “Save money, Live well” Backed by our 30 day money back guarantee. 100% Made in the USA. All images and descriptions are the sole property of Happy Wraps and may not be copied or duplicated without written documentation.Violators will be will be held liable for copyright and trademark infringement.